It’s been a while since I looked at the website. Since there’s still no picture of Phar Lap, I’m sending this one. Not the best picture, but at least it proves she exists! With the bottom getting scraped by Scuba Duba this week, we should be sailing on Saturday! Great news that there is a Dolphin 24 web site! I looked many times, but never found one. I don’t know what made me type it into the search engine again, but last week I did and found yours. We bought the Phar Lap from Jerry Stimmel in April. I say we as there are actually three Captains, Rod Hay (me), Jamie Dote-Kwan and Steve Shields. I learned how to sail about 8 years ago at Long Beach Park and Rec and wanted to buy a boat ever since. I often walked the docks in Alamitos Bay (Long Beach) and the Phar Lap was the prettiest boat in the harbor. A little over a year ago she started looking a little shabby and it was obvious she wasn’t being used. I eventually sent a letter to Gerry through the Harbor Master and he said he would be willing to sell. All the bright work needed to be redone, and we are doing that now. 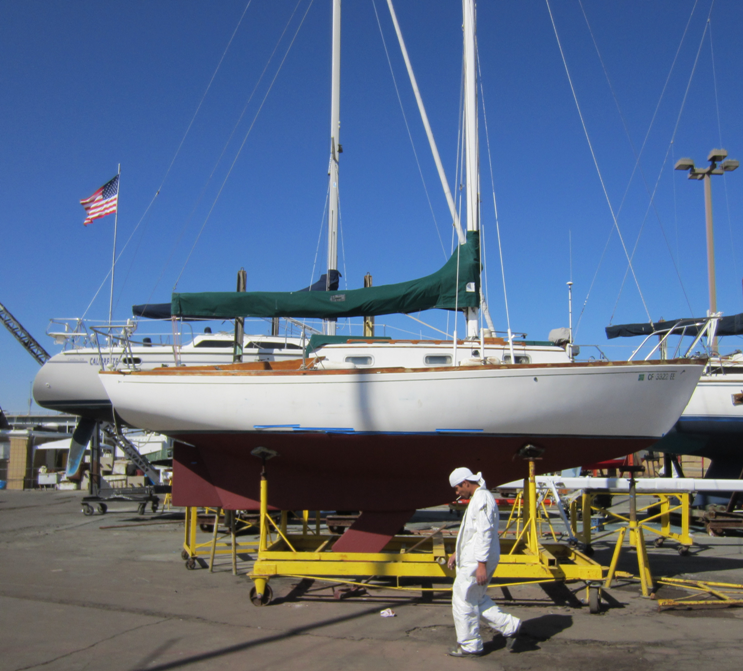 As soon as she is again, “the prettiest boat in the harbor,” we’ll send you some pictures. A fun boat for sure, and I hope we’ll have some stories for you soon. We first found out about Phar Lap from the following February, 1999 Good Old Boat Newsletter written by former owner Gerry Stimmell. In 1995 a partner of mine in the L.A. Co. Sheriff's Dept. 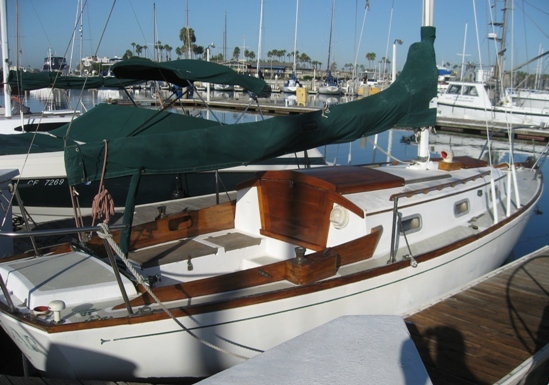 bought a 1968 Yankee Dolphin which we sailed for more than a year. In 1996 he transferred to another station and sold the boat to a civilian. In November of this year I ran into a fellow employee who happened to have a boat for sale. When I inquired as to what brand of boat he had, he stated that he had a Sparkman & Stephens-designed 24-footer, a Yankee Dolphin. I replied, "No kidding, I used to go sailing every week rain or shine on a Yankee Dolphin. It's not, by chance named Phar Lap, is it?" And sure enough, it was Phar Lap. She's had two owners since I sailed on her, but she is now mine. It is interesting to note that moments before talking to this deputy about his boat, we were having a discussion about fate. Afterward we felt that fate had come into play and that I was meant to be the next owner of Phar Lap. The best part is yet to come. My former partner, who now works for the PATF and doesn't know I now have Phar Lap, is coming to visit on Sunday for what I hope will be a pleasant surprise. You're doing a great job with the Dolphin 24 web site. I hope you can reach more of the current, former, and future owners who will be inspired to share their experiences with you. I had first seen Phar Lap as I walked around the harbor admiring boats, and dreaming that one day I'd own a "real" boat. At the time, I was road racing motorcycles. My wife thought that, perhaps, racing was a dangerous hobby. So, she encouraged me to buy a boat. I had seen the for sale sign on Phar Lap on a previous visit to the harbor, so I went back to jot down the phone number. Unfortunately, when I reached the boat, the sign was gone and a pretty young woman was busy swapping in a new outboard motor for the old corroded lump. We made small talk, and for a reason that now escapes me, we exchanged email. A few days later, she wrote to me, offering to sell Phar Lap. So, I bought her (the boat, not the girl). I had a great time with Phar Lap. After going out once, my kids never did develop a love for the water like I had hoped. My wife always had something else to do…like watching the kids. So, I always ended up single-handing Phar Lap. Just her and me. It was, as all Dolphin owners know, a wonderful time. I didn't stop racing motorcycles, though. Eventually, I moved my family into a bigger house. The new house was significantly further from the harbor, and I was finding it harder and harder to make the time to go sailing (or racing for that matter—I gave that up shortly after I moved). And, when I did get to the harbor, I found that I'd go onboard intending to do a bit of maintenance, settle into the cockpit to enjoy the day a bit before I began anything serious. Then, somehow, I'd suddenly be surprised that the sun was going down. I'd have spent the entire day relaxing and daydreaming in the cockpit. Ultimately, I decided that I had to sell Phar Lap because I couldn't devote enough time to her. As Gerald mentioned, we were chatting about nothing in particular one day. I noticed that he had a listing of boats for sale. I casually asked if he was looking to buy a boat. He was, we struck a deal, and he became the new owner of the boat he had sailed and loved years before. While I owned Phar Lap, I had some correspondence with other Dolphin owners. One, an early owner, sent me a bit of history as he recalled it. I thought you might find it interesting, so I'm pasting it below my sig, since it's fairly long. Webmaster note: This early owner referenced is Matt Colie, former owner of Sambo. She sailed in eastern Connecticut waters and we are working on getting her up on the site. We'll include some of Matt's 1998 email referenced above when we get some more info on her. December 14, 2011. Another picture from Rod!! "Phar Lap in the boat yard - I just got the bottom painted - the top is in need of some TLC..."